A micro dairy producing small-batch raw milk, aged goat cheese, and unique, fresh goat milk specialties. 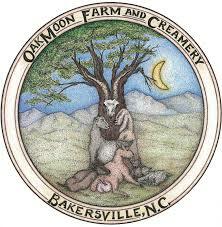 OakMoon Farm is a micro dairy producing small-batch raw milk aged goat cheeses and unique fresh goat milk specialties. OakMoon is located in the charming hamlet of Bakersville nestled at the foot of Roan Mountain in the heart of the Blue Ridge Mountains of North Carolina. The farm was born of the love and determination of two people who just never know when to give up, and who believe that things happen the way they are supposed to. Get updates about Neck of the Woods !